LAUNCH took over Mayfair Gallery & transformed it into an arts space for an entire week in January. Consider it an inner city living room/studio for you to taste, tease and squeeze your creative juices. The space was a smorgasbord of events, alive with visual arts, performances and workshops. The program offers young people the chance to work alongside professional artists, develop skills across a wide range of art forms and gain accreditation, opening pathways into the creative industries. Art materials, nibbles, free workshops, comfy couches and the exchange of creative ideas were made available for your enjoyment. 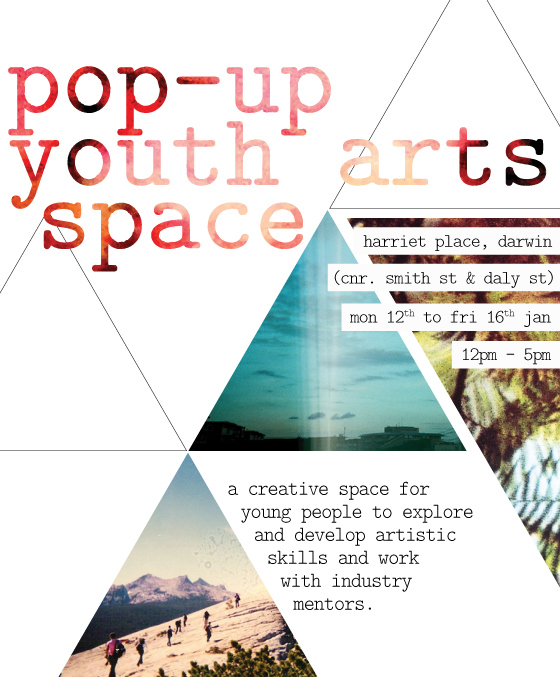 Keep an eye out for future pop-up youth arts spaces! Work with Darwin street art royalty, David Collins, to transform a lowly skateboard deck into a work of art. Working with aerosol and paint pens, learn some essential street art skills & explore stenciling, freehand painting and more. Booking essential, only 15 places available. Bring your own unique story to life through stop motion animation! Al Oldfield will walk you through the exciting world of clay animation and assist you to produce your own short stop-motion film! Want to know how to take epic photos and get the most likes on Instagram? Well the trick is in your pocket and your imagination. Join filmmaker and photographer Amy Hetherington for an interactive workshop in iPhone/iPad photography and get the skills to snap awesome moments, employ those filters and perfect the magic art of selfies. It's a workshop filled with super quick competitions and photo challenges to test your skills. Get involved. Design, create and customise your own unique wearable art using recycled fashion, objects and even household trash and hardwaresupplies! Bring along your fave old tee, jewellery, warehouse nuts and bolts and household trash such as drink cans. Or just bring along a little inspiration! Our resident designers will share their creative techniques to bring new life to your old clothes and odds and ends. Learn how to manipulate leather using professional tools, inks and paints. Create colourful cuffs, a swag belt, belt or guitar strap. Got a knack for composing rhymes and crafting beats? Work with MC Task to improve your MC and beatmaking skills and produce your own music. Join the ladies from 'Our Common Threads' to screen print your own hand cut stencil, weave a rag rug with material scraps and let your creativity explode! Mayfair Gallery, Harriet Place, Darwin. Corner of Smith & Daly St.